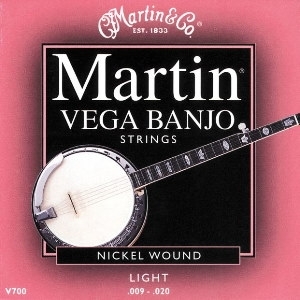 The Martin V700 Vega Banjo Strings are made from a selected nickel/steel alloy that produces rich tonal qualities which are best suited to accent the strong resonating tendencies of most banjos. Vega strings are highly resistant to corrosion. The smooth consistency of the wrap wires makes them ideal for all styles of banjo playing. Light. Gauges 09-10-13-20-09.